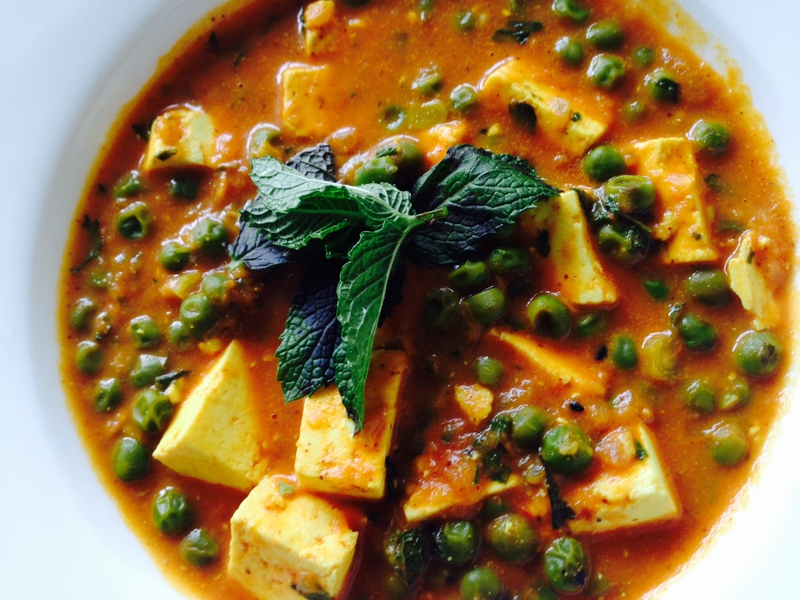 Sometimes when I am pressed for time and I have to prepare something that the whole family will love, I make peas and paneer dish. Traditionally in the restaurants they add cream and cashewnuts making it very rich in taste, texture and not to forget in Calories !!! Off course so when I make it, I try to make it as healthy as possible by including different greens. And to give it creamy texture I have added almond butter, voila now it is creamy without the cholestrol ( from the actual cream ) but it will also provide good fats from the almonds thereby helping with good cholestrol. Generally cilantro is herb most commonly used herb in Indian cuisine but this time with surplus of aromatic mint in my yard I decided to use mint not as a garnish but used it generously so that it makes this generally dense heavy dish refreshing, light and aromatic and offcourse very summary. Hope you will enjoy this dish as much as my family did. 1. In a chopper chop green chillies, onion, ginger and garlic. It should be very finely chopped, have texture and not ground into a paste. 2. Heat the ghee in a heavy bottom pan add Nigella seeds and saute’ the above mixture till fragrant and translucent ( 4-5 min. on medium heat). 3. Now add peas and cook for 7-8 min. you may add a little water if the mixture starts to stick to the pan. Add the turmeric and red chilli powder. 4. In the same chopper finely chop the mint leaves, put aside. 5. In a mixer or the same chopper blend the tomato, almond butter and the tomato puree. 6. Once the peas are softened add tomato, almond mixture and let the curry heat thoroughly. If it is too thick add 1/4 cup of water. You may add salt now. 7.Add cubed paneer at this stage so it can soak up the different flavours. 8. After few minutes add the mint leaves and mix well and turn off the stove and allow the cool refreshing minty flavour to permeate into the peas and paneer. 9.Serve steaming hot with naan bread, chapatis or rice. Enjoy !!! You know I love to use different leafy greens in my cooking, no greens no life !! that is my philosphy. 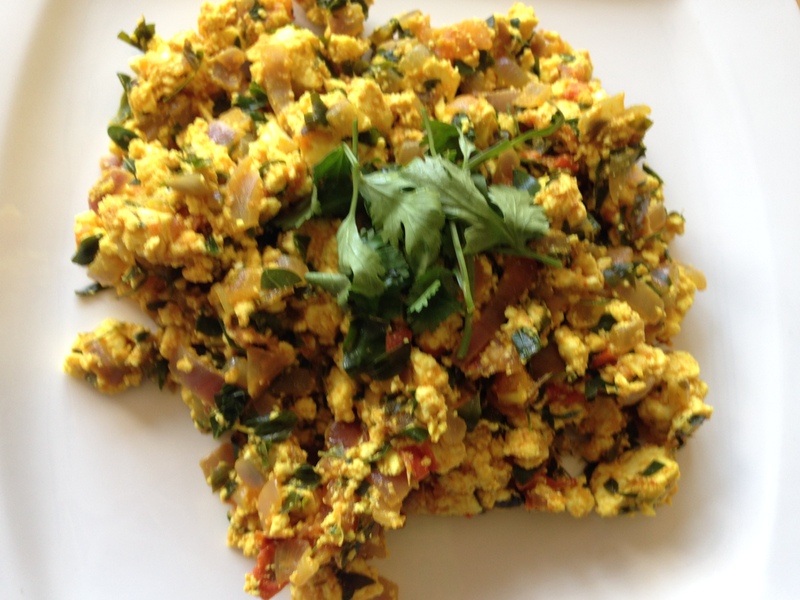 sometimes when I am pressed for time I like to whip up quickly Scrambled Paneer ( Indian cottage cheese) / Tofu dish. 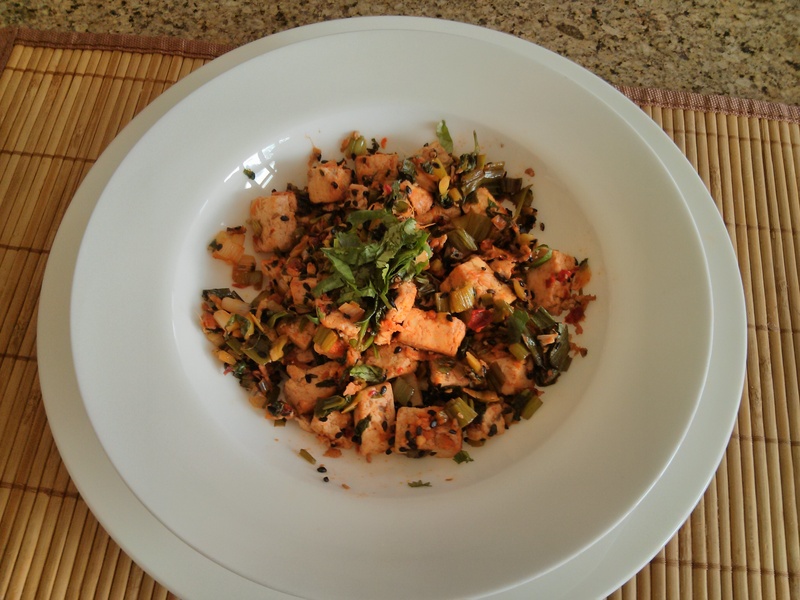 It is quick, easy and extremely nutritious and off course not to forget a family favourite. 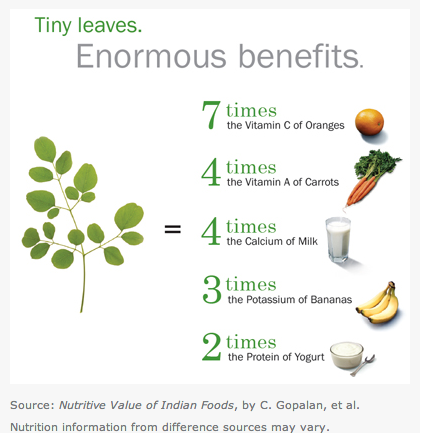 I generally use of lots of cilantro and fenugreek leaves but this time I have used fresh moringa leaves which are not just healthy but a powerhouse of nutrition. The tree because of its different and varied uses and superfood properties is popularly known as Tree of life. This vegetable is also called the tree of life because it has life sustaining properties, grows even in drought prone areas. These leaves are not difficult to separate from the stems, though it would take 15- 20 minutes to remove the twigs from the leaves. Growing up I remember my mother talking about these leaves. We ate the flowers, the pods (drumsticks) but not the leaves (which are also readily available). 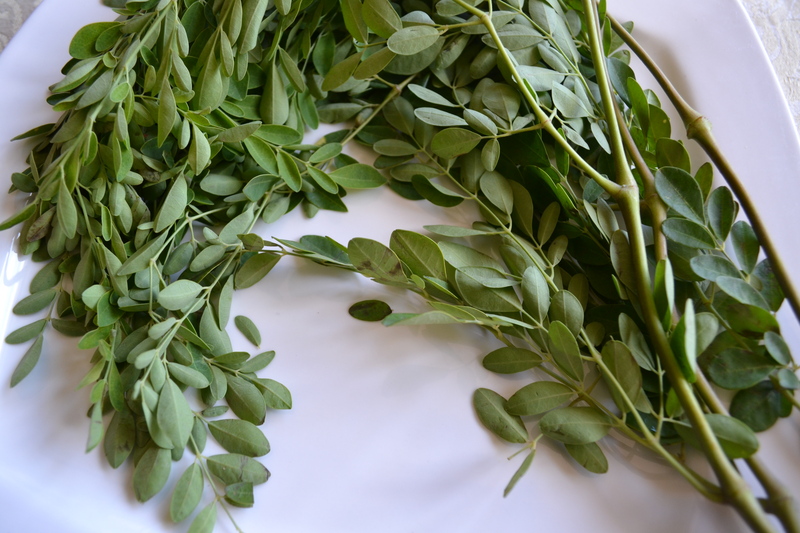 These leaves are available in Sri Lankan stores in North America.They look like Methi(fenugreek leaves ) but are not bitter and are lot more coarse in texture than spinach and methi. So please do not feel overwhelmed by this vegetable. Get out of the comfort zone of the familiar and ordinary and try something new!!! 1. Saute’ the onion and chopped moringa leaves in heated oil for few minutes till onion is translucent and the greens are glistening ( 4 – 5 minutes ). 2. Add the finely chopped tomato to it and wait few minutes for the tomato to be cooked . 3. Meanwhile crumble the paneer or tofu with your hand making sure no big pieces remain. 4. Add the turmeric and the red chilli powder and salt to the onion mix well and then add the crumbled panner . Mix well and cook on medium heat for 10 – 12 minutes till the flavours of different ingredients have blended and the paneer is cooked through ( does not need to browned ). 5. Enjoy !!! Serve with chapati or use as a filling for a wrap. Tandoor literally means a cylindrical clay oven inside which wood or charcoal is burnt and the food is cooked inside this oven. The temperature in the oven can reach up to 450 degrees F. The oven is kept continuously lit to maintain these high temperatures. Food is thus cooked on live coal, cooked also with convection heat and also gets the smoky flavour from the juices and fats from meats and vegetables dripping on to burning wood or coal. This type of cooking is popular in southern, western and central Asia. Breads , meats and vegetables they all acquire a distinct smoky flavour from the Tandoor. Most people identify Tandoori cooking with the artificially coloured Tandoori chicken ( not the best representation of such a traditional healthy way of cooking!!! And off course who can forget the buttery soft Naan bread and Rotis. I have brought you today another popular dish called tandoori paneer off course not made in the tradional clay oven but an easier version made in a toaster oven or a big oven. I find a good toaster oven very versatile. This dish was a hit at the latest family dinner.hope you will enjoy it as much as we did. You can buy paneer in indian grocery stores and also some big mainstream grocery stores. 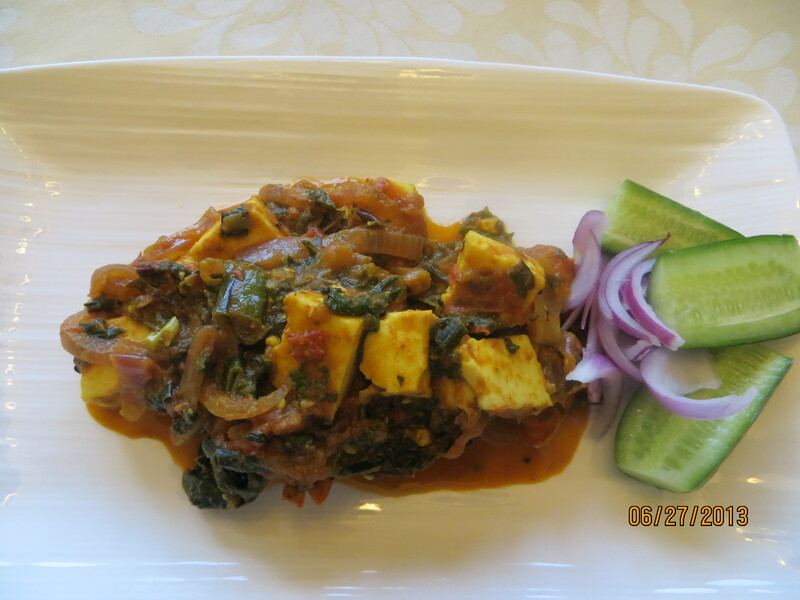 You can also subsitute the paneer with exra firm tofu. 1. Mix all the above ingredients except the oil and let it sit either overnight or even few hours so that the flavours soak in. 2. Mix the oil in the mixture. 3. In a baking dish or a tray spread the paneer mixture evenly and bake at 350 degrees F for a 15 – 20 minutes stirring occasionally. 4. Once baked, the vegetables are tender crisp and edges start to brown you can broil it for another 5- 7 minutes. 5. Please adjust the baking time depending on your oven and your personal preference as to how grilled you want everything to be. 6. 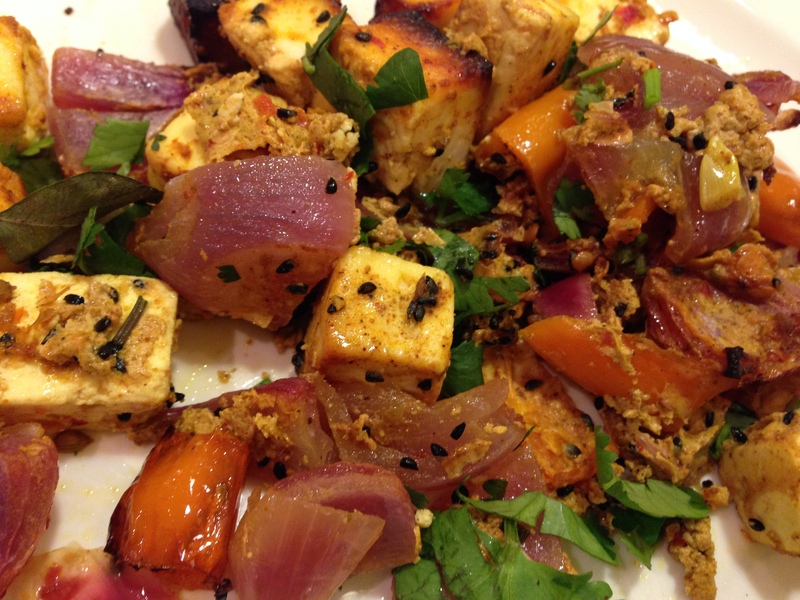 Once grilled the paneer should be moist and vegetables sweet and juicy. 7. Serve as an appetizer or over steamed rice or make a wrap. You may serve it with a green chutney. 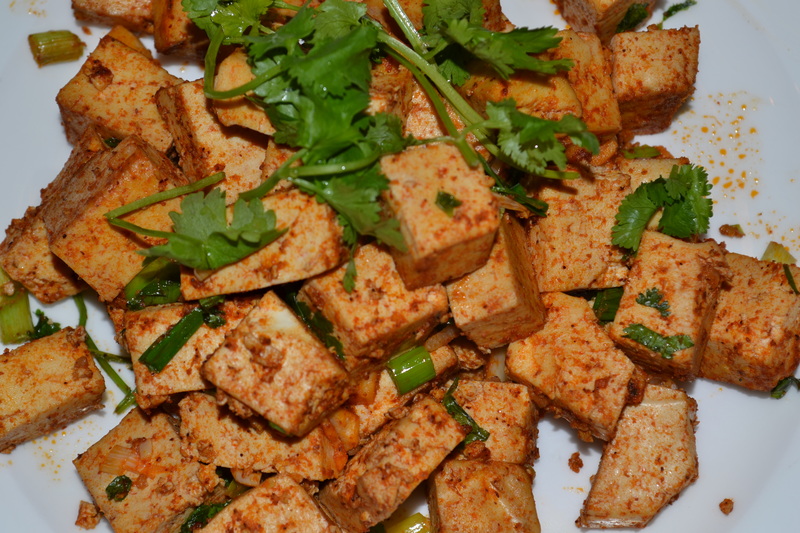 A simple, quick but delicious dry tofu dish best served as an appetizer or as a healthy snack in between meals. 1. In a skillet add bragg and oil together and cook tofu for few minutes turning frequently. 2. Once the tofu starts to brown and crisp add bokchoy and spring onions . 3. after few minutes dilute the thick curry paste with 2-3 tbsp. of water and add to the tofu . 4. Cook for 5-7 minutes on medium heat till the tofu is cooked well with vegetables. 5. Garnish with cilantro and serve piping hot. A flavourful healthy protein rich dish using delicious nutritious beet leafy greens( normally thrown away) and dandelion greens great for detoxification of liver . Heat the ghee in a heavy bottom pan and saute’ garlic, nigella seeds and onion for a minute. Move the greens to one side and add tomatoes so that tomatoes line the bottom of the pan. Add sorrel leaves salt ,black pepper, cayenne and turmeric powder. After 5- 7 minutes add tofu and simmer for 10 – 12 minutes till heated through and tofu soaks up all the flavours . Enjoy this fragrant delicious curry with rice or bread or chapati. A quick beautiful delicious and healthy dish that me and my husband put together literally in 10 minutes for my son because he wanted a PROPER home cooked meal. He smiled when he saw so many greens in there but thoroughly enjoyed and appreciated the final product. 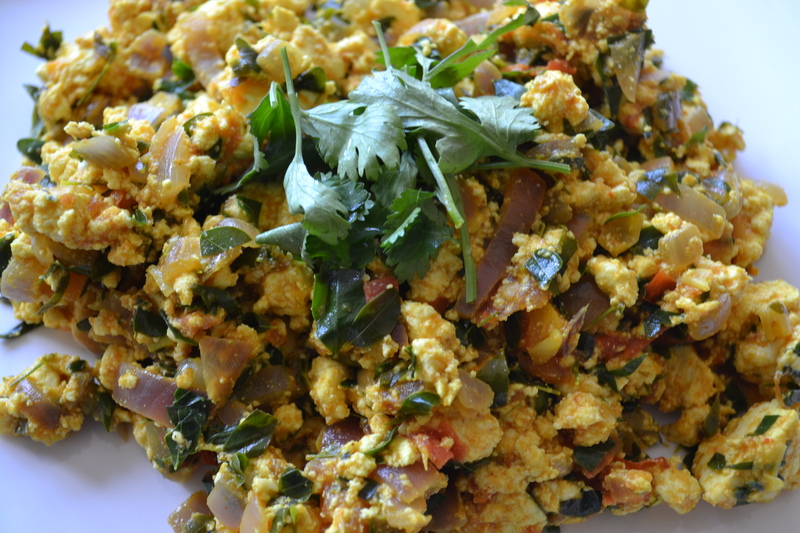 A high protein colourful vegetarian main dish with chockfull of vitamins and minerals. Heat the oil in a skillet,add nigella seeds,saute for 30 seconds.there will be a sweet aromatic fragrance at this point. At this point add the greens and garlic, onion and the red pepper ,saute for a few minutes, add turmeric ,chilli powder and tomato puree.and the paneer(cottage cheese). Let it simmer for few minutes and it is now ready to serve . Serve with plain rice ,Nan bread or chapatti. P.S. The baby greens came all mixed and washed so it was easy to use them in this dish, you could also use some organic salad greens. I am back after a weekend full of fun, family, friends and laughter at my husband’s surprise 50th (at least he pretended to be!!!) birthday party. 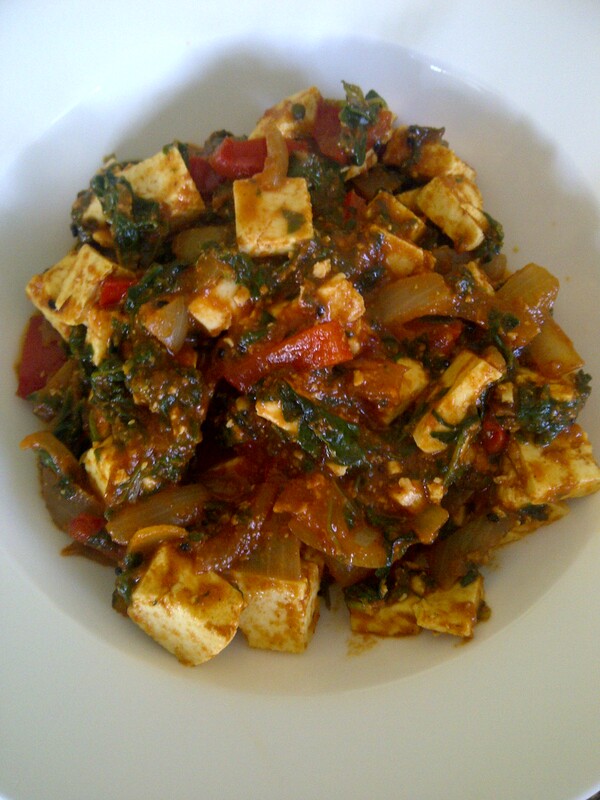 So now it is back to my labour of love blog greenzgrains.wordpress.com and the new tofu recipe. Heat a heavy bottom pan or a cast iron skillet and add sesame seed oil. -Serve hot as a tasty quick snack. Variation- May add it to stir fried vegetables and serve over brown rice or noodles.